WiFi networks, Cellphone and Radio Signals. These are just a few of the waves that are spamming the Electro Magnetic Spectrum around you most of the time. You can harvest this energy for more than its intended use. 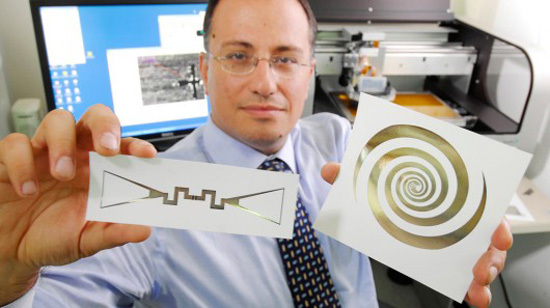 With printable antennas, you can power battery free electronics in most urban environments. Since this technology is still in its infancy and generates only a few milliwatts, so don’t expect it to power your cellphone or laptop anytime soon. What this technology is good for is powering networks of sensors in locations that don’t have electrical outlets, batteries or access to solar power. This could be a temperature sensor placed in the wall of your home, or a sensor built into the body of your car to check for structural damage. These sensors could also be teamed up with capacitors to collect power and send short bursts of wireless data to a receiver nearby.